You are here: Home / Amy Sue Nathan / Do You Hear What I Hear? I am huge fan of audiobooks. On any stint when I’m a gymrat, I listen to books while I work out. For me, the time passes much more quickly than when I listen to music. I listened to the entire collection of David Sedaris books one summer on the treadmill, and that fall I made my way through Jen Lancaster books while huffing and puffing on the elliptical After that, I realized how time would fly if I was listening to a great story while I was doing something else I really didn’t like doing. Housework! So I started listening to books while I folded the laundry or scrubbed the bathroom. When my son started college in 2010, and ever since, audio books are my steady companions on my four-hour drive to visit him in the depths of Indiana. And while it’s an odd thing to suggest, this Spring you will be able to listen to The Glass Wives while scrubbing your own bathroom or running on the treadmill or on a long, flat drive to visit your own kid somewhere! That’s because The Glass Wives audio rights have been sold to Brilliance Audio! That means when the book is available to read, it will also be available to hear. No, I won’t be the narrator. But I will be a listener. That’s right, I plan to listen to the book. After all, I might have written it and read it aloud to myself seventy gazillion times, but I’ve never had it read—to me! I love to read. I read almost every day, but listening to a book is a wonderful way to experience it. If you’ve never listened to an audiobook (although I almost always refer to them as a books-on-tape, jeez) know that the book isn’t just read, it’s performed. It’s a sensory experience different from reading because while you can rest your eyes (not while you’re cleaning or driving, please) the pace of the story is determined by the performer. It’s like watching a movie and sitting on the edge of your seat waiting for something to happen, but not being able to hit fast forward. I tend to read quickly—and audio books slow me down, which I appreciate. It’s true, sometimes I’m so engrossed in the story that I do more listening than anything else, and I have a feeling it will be difficult to concentrate on anything other than The Glass Wives when I’m listening to it. I’ll report back and let you know! And if you listen to The Glass Wives, please let me know. So, are you a fan of audio books? And what do you do while listening? If you’ve never listened to a book (no, not on tape, I caught myself) is it something you’d consider? « The Glass Wives ARC Winner Announced!!! So thrilled for you, Amy! I LOVE audio books when I drive. It doubles my reading time, and I will be among your listeners! YAY YOU! I have to confess I’ve never done the audiobook thing. I have a friend who listens religiously during her commute and loves it. Music is my companion during my long walks, but one of these years (maybe when the eyes go) I’ll give audiobooks a try. Congrats! I’m thrilled to have you read TGW on Kindle, Zan Marie. I actually listened to Outlander! It was a wonderful “read” for me! I love all the Diana Gabaldon books. Such lovely and lively stories! I’ll line up to listen, Amy! I carry my iPod when I cook, drive, walk, or workout–which gives me a lot more time to “read” than I manage on my Kindle. I have a friend who swears by audiobooks but I confess I listen to classical when I drive or use the silence to think about work. And housework! Hmmm. I guess I should be doing more of it..
I’m not sure I could listen to my own book broadcast – I’d be terrified of hearing stuff that didn’t flow or words that jarred. But think of how good you will feel when your work is buzzing in the room and you are now detached from it. A completed book, out there for listeners. How satisfying will that be? I tried to listen to an audiobook once. I got it from the library. It was an author I’d never tried before and I ended up liking her “writing” so much that I wanted to read it for real, so I stopped and got the ebook edition instead. On the other hand though, it also might be nice to listen to an audiobook of something very dense too, like some of the classics. Those are great ideas, Laura. I am engrossed in story when listening to a book, which is why it works well for me when exercising. I’m much more likely to keep going than if I was listening to music. I don’t really get involved in music nor am I very vested in what I’m listening to. Unless it’s “Save A Horse, Ride A Cowboy” that is. Congrats, Amy! 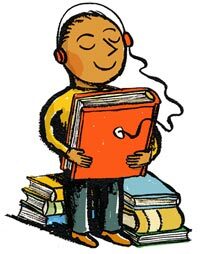 Listening to audiobooks is how I “read” most books these days. It’s amazing how many books you can get through while doing your usual driving around town. It can take me 3 – 4 weeks to get through a book if I don’t have a long drive planned, and I like that in a way…as it just lasts longer! Of course I have been known to just sit in the driveway to finish a chapter. This is such fantastic news, Amy! I love audio books-except when they make me miss the exit on a highway because I’m listening too intently to know where I am. Oooh… Congrats on selling your audiobook rights! I wrote a post about this very thing last year – using various technology options to get more reading in WHILE exercising (and doing other things). And while the audiobook was wonderful for running around the tiny track in our town — without going insane after lap 20 — I still feel I prefer the act of reading vs. listening, when it comes to books. So, my solution was the Kindle on the treadmill. You can crank up the point size, and voila! Takes my mind, again, off the monotony; plus I still get to READ! Great ideas, Amy Sue. I should start listening to audiobooks (I just about said books on tape, too) while doing chores as well! Congratulations on selling audio book rights Amy! Last two were JoJo Moyles novels but hands down the best one ever (until now?”) was Jeremy Irons narrating Brideshead Revisited. I just started reading Me Before You by Jojo Moyes! So much buzz—I couldn’t help myself. And I’ll admit, I was hooked from page one. Congrats. I constantly listen to books in my car as I feel there’s nothing much on the radio. I am delighted for you. Busy people often get their knowledge and entertainment from doing two things at once, but holding a book and reading is even better. That’s fantastic news, Amy! How amazing it will be to hear your words delivered through that medium. What a thrill to hear someone read YOUR story. So happy for you, Amy. I love audiobooks, too, and so much depends on the narrator. My favorite audio was THE HELP. Can’t wait to listen to TGW! I’m sitting in my car in my work parking lot this exact moment listening to Ian McEwan’s Atonement. It’s a key scene and work must wait. I listen in the car during my commute. At the gym I listen to NPR podcasts. I rarely have enough time to sit down and read but can squeeze it into my commute. Woo hoo Amy and Woo hoo Brilliance! One of my dearest friends works for them so I’m always happy to see their name out & about. Looking forward to the book release!